Paul killed it! We showed him the color of the wedding party dresses and tuxes, and he efficiently guided us to the best color combos. And it was all a great deal! The initial consultation meeting with Westgate impressed us so much that we immediately contracted them. They listened to us and asked us questions until they had a thorough understanding of our vision for the flowers. They didn’t just provide us examples; they would actually pull up pictures of different flowers and greenery and describe them in detail to see what our opinion on them was. They truly customized our vision and cultured it into a reality! Thank you, Westgate team! The flowers for our wedding were wonderful! They provided exactly what I was looking for! I met with Paul a month or two ago to talk flowers for my wedding next June. I showed him pictures of 3 different bouquets that I liked and he immediately picked out the flowers that were in all the bouquets and showed me pictures online of all the different flowers and we custom built my bridal bouquet and bridesmaid bouquets. He really knows his stuff and I totally trust him to create the bouquets I want! Paul and his team did an outstanding job for our November 19th wedding at the Newberry Library. Westgate had come highly recommended by a friend and we jumped at the chance at using him. Paul is a true professional and knows the flower biz. He is kind, patient, and has great taste. Our bouquets, corsages, and table arrangements came out just gorgeous. Many guests came to compliment us during the reception. He and his team built our chuppah from scratch! We also used Westgate for our rehearsal dinner flowers too and they also came our just perfect. We can’t wait to use Westgate and Paul again very soon!! Paul & team did a fantastic job on all the flowers for our daughter’s wedding. It was an outdoor ceremony with an arbor, 8 attendees on each side, and beautiful table arrangements for the reception in Long Grove, IL. I would strongly recommend Westgate. We were 100% pleased with our flowers from Westgate and they made our wedding day perfect! We loved working with Paul and he took our visions and brought them to life. We appreciated working with a local company and the services they provided were impeccable. I especially appreciated the last minute changes we made due to the number of guests and how quickly and seamlessly the changes went through. In addition, when the flowers were delivered to us on the wedding day it was evident that care, precision, and pride was taken when preparing all the arrangements. We would 100% recommend Westgate not only for weddings, but any floral needs in your future! We will continue to work with Westgate for many years to come! Paul at Westgate was absolutely great to work with. Down to earth, realistic, efficient, and creative. We met with a lot of florists before him: many of them tried to sell us the big dream with rainbows and butterflies only to hand us a giant bill that would’ve sullied the beautiful experience. Paul was different from the start: he listened, worked with us to maintain our budget, and put his own creative spin on things when asked to. He is a true professional, delivering what we explicitly and implicitly hoped for. A little example: Due to our budget, our decor was simple for the most part, except for the arbor under which we married. This floral arbor was left to Paul’s creative choices and the result was absolutely magnificent – more perfect than we could’ve imagined. I can’t stop staring at the pictures we took of it. In conclusion, if you want to work with someone who’s a real professional, honest and down to earth, with a great sense of floral design and decor, go with Westgate Flowers. Worked with Paul at Westgate Florist in Oak Park and they far exceeded our expectations. Our flowers were the most beautiful flowers we had seen at any wedding. Our June wedding helped with lots of peonies, garden roses, succulents, etc. We used them for all wedding ceremony flowers and reception flowers. Our photographer even commented that the bridal bouquet was the most beautiful one he had ever photographed. Paul was creative and totally understood the look we were going for and came through with flying colors. Highly recommend this florist and they worked well with us when it came to our budget. Westgate was recommended to me by two people. 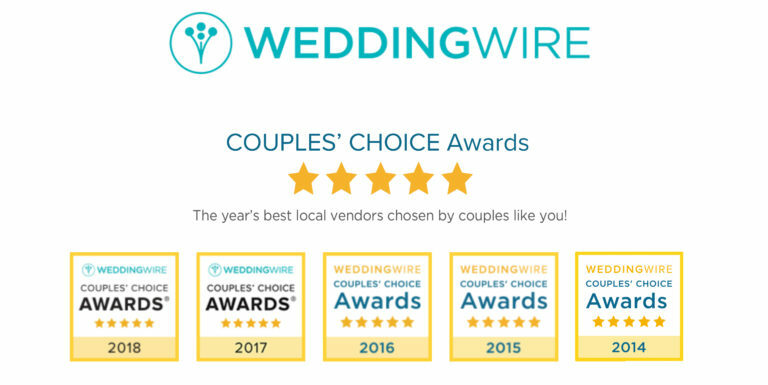 I selected Westgate for my wedding florals out of five florists that I interviewed and received proposals from. They are very friendly and easy to work with. Paul and I e-mailed initially to come up with general ideas and a ballpark budget. Then I went into the shop for a consultation and final selection. I had a relatively low budget (no bridesmaids, no church flowers, 11-12 reception tables), which Westgate was able to work with. There was no minimum amount, which most florists had. Westgate’s fee to deliver to my venue in the city was lower than the florists’ in the city. The arrangements were gorgeous and matched my multi-color scheme. We used the centerpieces for brunch the next day, and they held up well. Guests complimented the flowers and asked who did them.